Price listed includes daycare for one dog. Add $15/night for each additional dog staying in same suite. Rates are charged per night with pick-up by noon the following day. An additional charge for daycare (full or half day as applicable) will apply for pick-ups after noon. Please call or email to make reservations. Space is limited. A non-refundable deposit of $50 will be charged at time of reservation and will be credited to final bill at check-out. We are located on the East side of Cincinnati at 5614 Wooster Pike. FurKids is located just minutes from Mariemont, Mt. Lookout, and Hyde Park, making it a convenient location for busy pet parents. 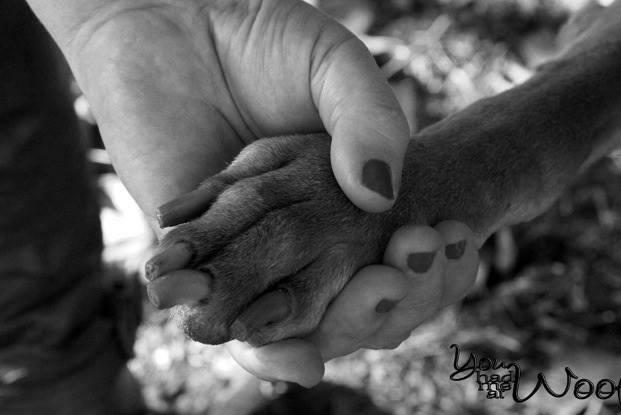 FurKids is owned and operated by good friends and animal-lovers Michele Ertel and Emily Casey. Though they attended the same high school, Michele and Emily just recently reconnected through their mutual love and dedication to rescue animals. Michele has over 8 years experience in owning and operating dog daycare and boarding facilities in Northern Ohio. After Michele and husband, Matt, returned home to Cincinnati for Matts job, Michele began looking for her next opportunity to do what she loves. When this chance came up, she knew it was perfect for her and Emily to do together. Not only does Michele have unparalleled daycare experience, she also has 6 dogs of her own and has fostered countless dogs and cats for numerous local rescues. Emily is a Registered Nurse and is in the process of becoming certified in Pet First Aid and CPR. She is an avid animal lover and has been a volunteer and foster (failure!) for Three Sisters/Ohio Hound Rescue. Emily often jokes that she lives in a zoo, with her 5 dogs, 5 cats, and 2 teenagers. She has been looking for an opportunity to focus more on her love for animals and is so excited to partner with Michele on this journey! Thank you to all who have encouraged and supported us! Three Sisters/Ohio Hound Rescue takes in dogs and cats from high risk situations, and places them with loving furrever families. For more information, visit www.threesisters.petfinder.com. I want to bring my dog to daycare. How do we get started? All dogs attending daycare need to be fully vaccinated and spayed/neutered (if over 6 months old). We ask that you call at least 24 hours in advance to schedule your first visit, and that you arrive no later than 9am on that first day. This allows your dog an easier introduction to the group setting. You'll need to bring your dog's vaccination records and complete a daycare application (found online or in our office). Your dog's first visit can be a half or full day and will include a behavior/temperament assessment to ensure that he/she is a good fit to join our pack. What vaccines are required for my dog to attend daycare/boarding? We require all dogs attending daycare and/or boarding to have the following vaccines: Rabies, DHLP (Distemper, Hepatitis, Leptospirosis, Parvovirus), and Bordetella. In addition, all dogs should be treated with flea prevention and worming medicines, and be spayed/neutered if over 6 months old. How old does my puppy need to be to attend daycare? We do not have a minimum age requirement. All puppies must have completed his/her puppy shots, including the Bordetella vaccine. Can my dog board there, if he/she has never been to daycare? Yes, but we do require that your dog come in for at least a half day of daycare prior to boarding. This will allow us to complete a behavior/temperament assessment, as well as give your dog an opportunity to be introduced to the facility and staff before coming to stay. 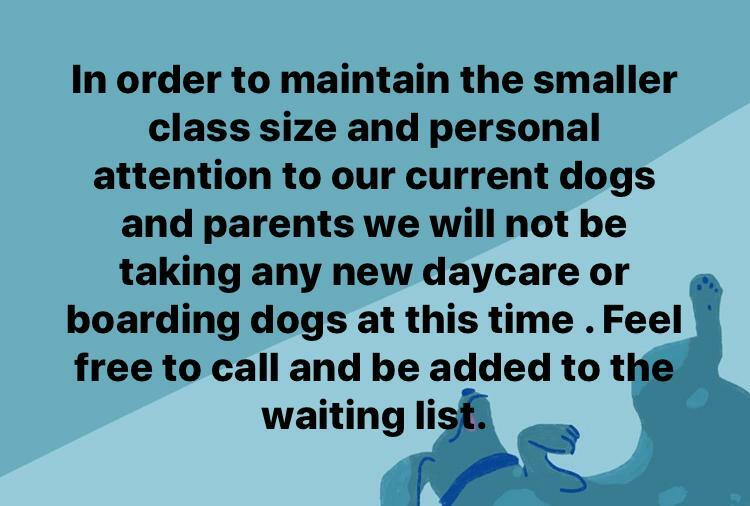 In order to maintain the smaller class size and personal attention to our current dogs and parents we will not be taking any new daycare or boarding dogs at this time. Feel free to call and be added to the waiting list.